I think that I could throw avocados in just about anything and it would make whatever I’m eating 100 times better. Although I have not tried avocados in desserts yet. (Sorry Tom.) Something about that just seems wrong to me. I shouldn’t knock it if I haven’t it tried it. But still. I love, love, love sweet potatoes, especially sweet potato fries. When we’re out to eat, I like to order them instead of regular potato fries. I “oh and ah” and make my husband try them but he’s not nearly as crazy about them as I am. Sorry, does not compute. Mmm, feta cheese. I’m half Greek so that explains that. 😉 I also think that if you’re familiar with my blog this doesn’t come as a shock to you because I use feta cheese in a lot of my recipes. Mmm, cheese. Magically, some of my favorite things have come together to make one delicious dish. What’s your latest food obsession? In a small bowl, whisk together the oil, lemon juice, salt, and pepper. Preheat the oven to 375 degrees F. Line a baking sheet with tin foil and set it aside. Toss the sweet potato pieces in the oil. Season them with dill, salt, and pepper and toss them again. Lay them on the prepared baking sheet, in a single layer. Cook the brown rice according to the directions on the package and then set it aside. 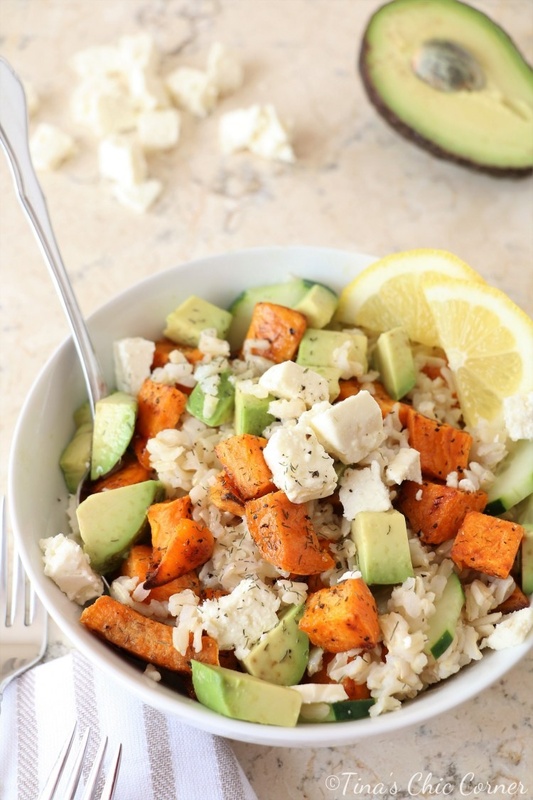 In a large bowl, gently mix together the baked sweet potato pieces, cooked brown rice, chopped avocado, sliced cucumber, and feta cheese. I would definitely try this, but without the avocados. But to be fair, I’ve never tried them. I know you saying, What? Maybe one of these days. You should definitely give avocados a chance, but with that said, this dish is very versatile so you could either leave it out or add something else that you love, like another veggie or beans.